Keeping it simple today I thought I might just compile a list of the methods I have used to dispose of the items that I have decluttered. 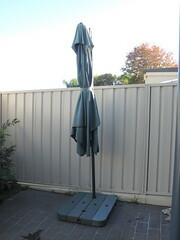 Curbside Donation explained: We live on a fairly busy road and I have been known to take large items that I no long require out to the footpath in the hope that someone will take them away. I place a sign saying FREE or PLEASE TAKE ME (being careful not to hold that on my person when walking out there in case they get the wrong idea) on the item and wait and see how long it takes for the item to disappear. My barbecue was a classic example of this method. Prior to 365 less thing I had used this method to get rid of a trampoline, a desk some wooden shelving and some large plastic tubs. thanks for that information, I was aware of most of these places although some are quite new to me. It is a great service isn’t it. I wonder if other countries offer this kind of service. Where I lived in America they had a neighbourhood association that the home owners paid annual fees to and every now and again the committee would hire a skip so people could have a clean out. I don’t imagine anyone will be taking my stuff away this time as it is all rusty. Colleen, your post inspired me to lug a disgusting warped old timber TV cabinet onto the kerb this morning. When I got home this afternoon it was gone. I have no place for ugly things in my life anymore! It’s amazing what people will take from the curb (or is it kerb?) I’ve left out MOULDY plastic kids’ toys and someone took them! I’ll be getting in trouble with the law soon for encouraging people to put their junk on the street. Ha ha! I think there must me a metal merchant that goes ahead of the council pick up in our area who takes all the metal items because most of my pile of junk was gone when I went to work this morning and it couldn’t possibly have been of use to anyone else. As for curb v kerb I think it may be one of those little international spelling differences like colour v color or aluminium v aluminum etc. I get very confused with these spellings because I lived in America for so long and I wasn’t a great speller to begin with. I’ve had the Curbside Miracle happen, too, many times. The last time I moved house, it was nearly winter and too cold for a yard sale, so I just up and put everything we weren’t taking with out on the curb–stuff would get picked up even before the next thing came out. Talked to one guy with a pickup truck loading up a baker’s rack and a footstool, who said he was trying to furnish his first apartment and couldn’t believe how easy I was making it for him, because he really liked the stuff. Told him to check back in an hour, there’d be an old armchair, too, and he did, he got it, and was happy as a clam. Made up for any small change I would have gotten if I’d try to sell on the cheap 😉 I miss that armchair, though, and hope to replace two less comfortable chairs with something similar one day. sounds like you have had some good success with at the curbside, good for you. It is raining today so I haven’t been out to the curb today to see if there is anything left out there. Maybe I should be scouting the house for other stuff to go before the pick up happens on Friday.